Almost all of us here at MIE have had our stories published as audio books. I am bringing up this topic in the hopes of starting a discussion on how we and other writers feel about the experience of listening to our own work coming out of someone else’s mouth. And how readers of this blog feel about “reading” with their ears. The only MIE author I ever heard from on this subject was Leighton Gage, who advised me about this, as he did about so many other things that a published author needs to know. He told me that mid-list authors like me almost never have any input whatsoever on who and how the books are recorded. He complained that the man who read his stories screwed up the pronunciations of the Brazilian names—people’s and places. But all in all he thought it was better to have the book recorded than not. As in almost all things, I agree with his assessment. I am a book addict. I take them any way I can, and that includes listening. I prefer to sit and read, but like most New Yorkers I walk as a means of transportation. Getting from one place to another gives me time to tune in to great stories on my phone, increasing the number of books I can “read.” I particularly like doing this with books I have already read, as I did recently with the brilliant John Fowles’s The French Lieutenant’s Woman. I could not have taken the time to reread it while sitting in a chair, but I was mightily glad to experience the work again while plowing my way through the throngs of tourists in midtown or strolling back and forth to the grocery store. 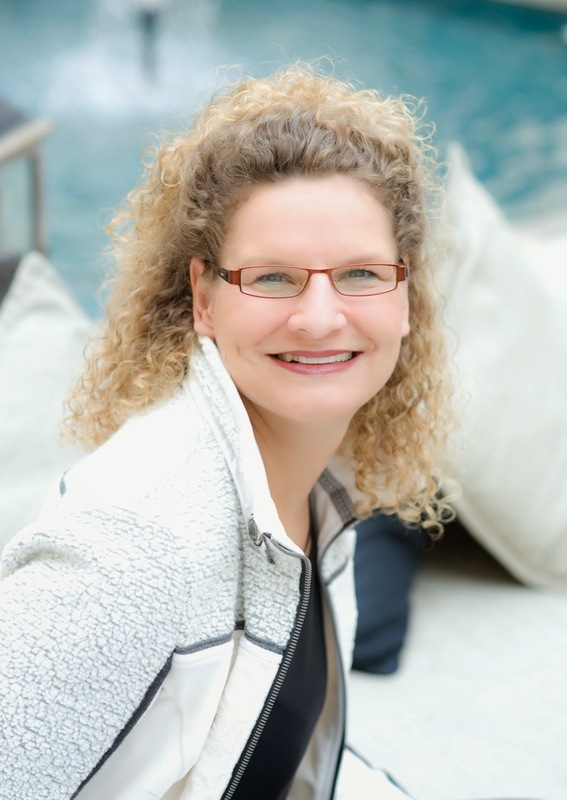 When I was reading Lisa Brackmann’s brilliant Rock, Paper, Tiger, I was in a particularly difficult and busy period of my life. 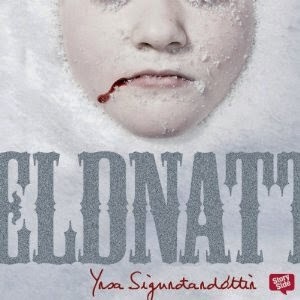 The book was a wonderful escape for me, and once I got into the story it made me want to stay in it, but I just couldn’t put together enough time to satisfy the intensity of my curiosity about how it would turn out. 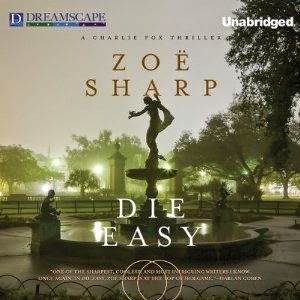 So I downloaded it from Audible and read part of it and listened to part. I really liked it in both formats. 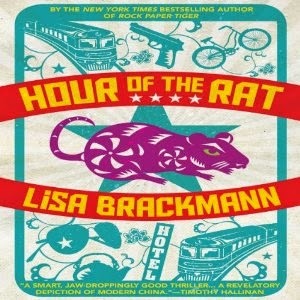 Now her Hour of the Rat has been nominated for an Anthony for Best Audio Book. 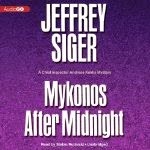 I have read it sitting down but now am in the process of listening to it too. My take: the narrator does a wonderful job of portraying the edginess of the story and of communicating Lisa’s riveting combination of wonder, wry commentary, and anxiety. I hope Lisa will weigh in on her reactions to this. Ditto for my other blogmates. 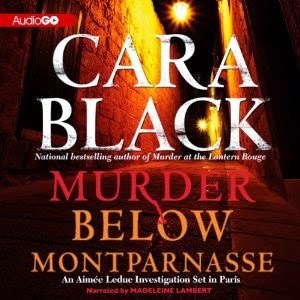 I was not able to find audio versions of Caro’s stories. That might be a blessing for her as a writer. Because there is that chance, as Leighton warned me, that one’s story will be mangled. The first two Audible versions of mine—Invisible Country and Blood Tango—were less than successful from my point of view. With Invisible Country, the first of my recorded books, I did not expect to find the Guarani names pronounced correctly. I tried to keep my expectations low. They were not low enough. The voice-over artist is a man, an understandable choice since it is an anti-war novel and is certainly as much a man’s story as a woman’s. My difficulty was in the voices the reader gave to my characters. The Paraguayan townswomen all speak in breathy whispers. Even the ultra-religiously devout Maria Claudia sounds like a bad imitation of Marilyn Monroe. 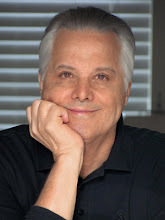 The lector gives a foreign-language accent to only one character: Tomas Pereira da Graça, an aristocratic Brazilian. The text says he has an accent. He speaks Spanish with an upper class Portuguese accent. In the audio version, he speaks in English, of course, but with a cheesy, comical Spanish accent. Think “My name Jose Jimenez.” UGHHH! The reader of Blood Tango is a woman with a Spanish accent. She does a good job, except for the fact that she almost invariably puts the greatest emphasis on prepositions. (In my mind, I was saying, “TROUBLE was closing in on Buenos Aires.” She read: “Trouble was closing in ON Buenos Aires.”) I am not sure a non-Spanish speaking listener would even understand that she is saying “Buenos Aires.” She speaks the names of the places and people in the story very quickly in Spanish. An American person experiencing the story only audibly will not have the advantage of the seeing, for instance “Campo de Mayo” spelled out. If she had pronounced it distinctly—Cahm-po day Maio, it would not have been a problem, but she slurs it. Imagine the FedEx commercial guy trying to say this: cmodmyo. I imagine that the sense of place pretty much disappears from the audio version of that book since there would be no way for people not intimately familiar with the landscape to get what I am talking about. Can people listening in English even identify the characters’ names clearly enough to distinguish them from one another? Hard to tell. Ah well. 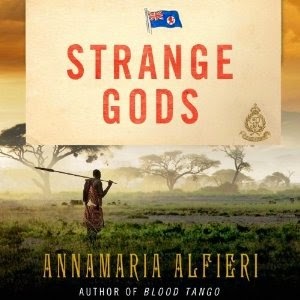 BUT NOW: the audio version of Strange Gods came out last week along with the book. 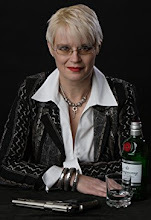 I am delighted to say that the voice-over artist does a wonderful job. He’s a South African named Dennis Kleinman. I looked him up. He was easy to find. He speaks the narration with a more or less neutral British accent, in which I picked up a tiny note of the South Africa here and there. He absolutely aces the dialog, doing upper class English, Scots, and tribes people. Sometimes the cadence of the narrative is not exactly how it sounds in my own head, but all in all his reading is quite wonderful. My characters sound so real in his voice. One of them is a bombastic District Commissioner, whom the narrator makes every bit as authoritarian, patronizing, and obnoxious as I imagined him to be. 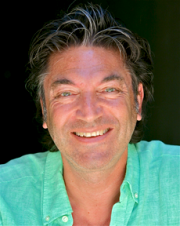 My story was safe with Dennis Kleinman. So what about you? Do you listen to books? Do you listen to your own work? If so, what’s your take on hearing your words read aloud by a stranger? 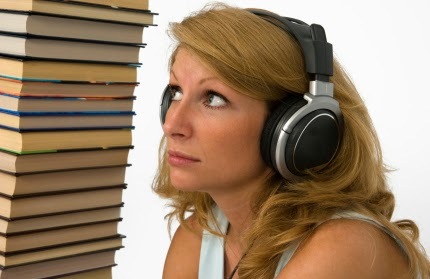 If you listen to audio books, how do you feel about the skill of the people who read them? Let’s talk. 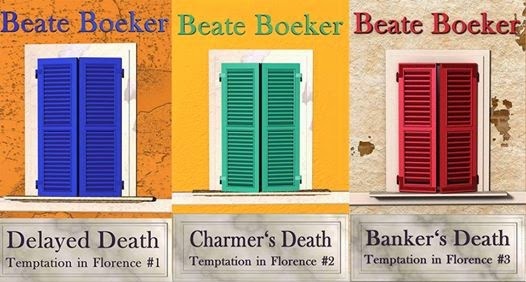 For Expected Death, the fourth novel in my mystery series, “Temptation in Florence,” I decided to throw the victim from a tower. It shouldn't be too difficult to find a nice tower for murder in Florence, I figured, after all, the ancient town with its century-old buildings offers plenty of choice. The first that came to my mind was the world-famous Campanile, of course. However, I had two obstacles to overcome – first, I only had two days to find the perfect tower because I don't live in Florence (something I really have to remedy one day! ), and second, I had to find a place without tourists. 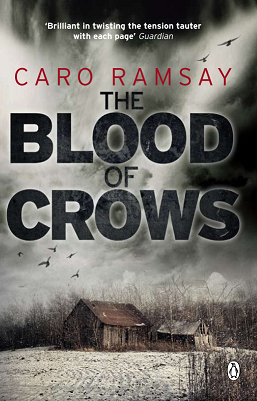 Particularly the second condition turned into a huge problem - because a murder that's being filmed and watched by an international multitude is not a good base for a good mystery yarn with some nice complications along the way. And in a city like Florence, finding a spot without tourists is almost impossible. This also ruled out the Campanile straight away – I mean, how likely is it that a murderer and the victim will both line up for hours before going up the tower together? I already knew that my main protagonists (the murderer and the victim) were no friends, so I could not count on them standing in line next to each other in perfect harmony. I asked around among author friends who knew the city and even contacted the tourist information, who were probably slightly alarmed by my request. I searched the Internet, poured over maps, checked out pictures and calculated heights, but I knew I had to see the place first hand before I could take a decision. When I arrived in Florence, I first tried my luck with the tower of the Pallazzo Vecchio, but a bored guard at the uppermost platform put a hold on any murderous intent. It would be foolhardy for any author to push someone from that tower – because it would leave nothing to do but a quick arrest. Remembering a recommendation from a friend, I then turned to the “oltrarno” - the other side of the Arno – to check out the Torre di San Niccolò. It has only been re-opened to the public in 2011, so it's not quite as well-known and overrun with tourists as many of the other spots in town. It also has a very satisfying height if you're looking for murder – sixty metres with flagged stones at the ground create a pretty good drop. The Tower San Niccolò was built in 1324 as a gate and part of the town wall. When centuries later, cannons were introduced and used to bombard the town, the high towers suddenly presented a good target, and so most of them were lowered, or decapitated, as the Italians say. The Tower of San Niccolò, however, remained at its original height because the hill right behind it protected it from the cannons. I thought that was providential until I stood on the top platform of the tower San Niccolò. The breathtaking view toward the historical city barely impressed me because when I turned into the other direction, I was ready to stamp my feet in frustration: I had overlooked that the hill behind the tower is topped by the famous Piazzale Michelangelo, which is one of the busiest places in the whole of Tuscany. Why, you ask? Because from the top of that hill, you don't only see Florence in all its splendor, but you can also park dozens of busses at once – with the result that every single tourist bus in Tuscany stops at the Piazzale Michelangelo for ten minutes or less to allow tourists to take a hurried picture before moving on to the next national treasure. I was devastated. Murdering someone on that tower would be like enacting a stage play, covered by the latest in Japanese filming technology. The picture shows that you're almost eye-to-eye with the tourists, particularly if you consider the strong zoom many cameras offer. Besides, the space between the merlons was secured by sturdy steel bars that made it terribly difficult to push the victim over. You really had to heave someone over the edge (and that someone had preferably be dead or unconscious already), otherwise, it would be way too difficult. A simple push wouldn't get you anywhere. My time was running out, and I still hadn't found a perfect tower. In the meantime, I had realized that planning murder at public buildings is “difficultissimo,” to say it in Italian, i.e., very difficult. However, I was not yet willing to give up. Being an author, I was at liberty to tweak some other details. As a first step, I made the victim very slim and small, so it would be easier to heave her across those bars. I also created a very foggy and rainy day with no view at all for the murder – to stop the tourists from seeing any details. And so I managed to get away with it after all, and the tower of San Niccolò will be a focal point of Expected Death coming out later in 2014. On Keeping Greece in the Game. 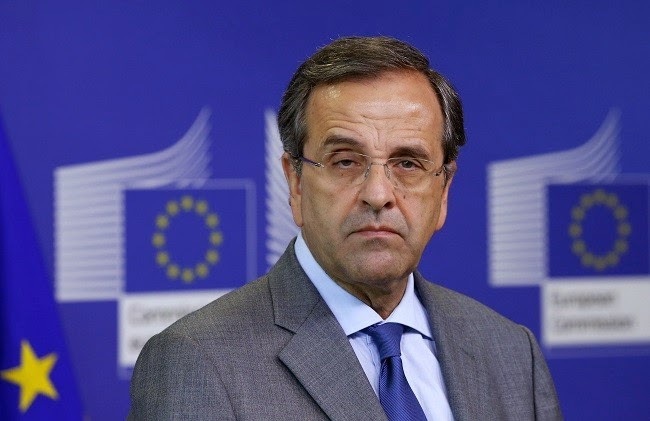 No, not Greek Prime Minister Antonis Samaras. I’m talking about Greek soccer player Georgios Samaras, a striker on Greece’s World Cup soccer team who scored the winning goal on a penalty kick in the injury-time additional three minutes of Greece’s Tuesday match against Ivory Coast to send his country into its first ever Final Sixteen stage of FIFA World Cup play. 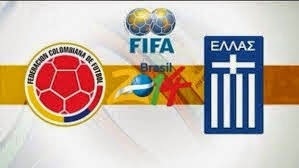 That elimination-round match takes place at eleven o’clock tomorrow night, Greek time, against Costa Rica. 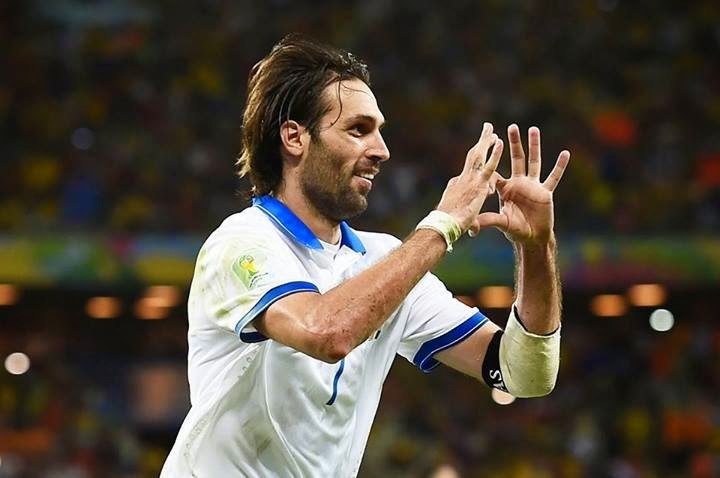 Greece’s victory brought joy to its beleaguered populace, just as Georgios Samaras said he hoped it would do in his post game remarks attributing success to a team effort. But alas, there’s an ironic twist to this hero. He came to Greece to support its national team, but earns his living elsewhere, playing for Scottish Premier League Team Celtic. And that my friends just about exhausts my knowledge of Georgios Samaras, World Cup play, and soccer in general. Though I must say I’ve grown to enjoy watching it…at least the well-played games, to the extent I can tell which ones they are. There are plenty of people who voted the current coalition government into power two years ago that feel they are being given no choice but to choose the opposition SYRIZA party in the next general election and resent it. They are angered by a number of political decisions made by the [Samaras] government following the cabinet reshuffle [three weeks ago] and especially by the removal of certain politicians who got things done and defended their choices openly. Even before the reshuffle, these voters were angry at decisions that showed the political system is incapable of changing its tune regardless of the mess it has made of the country. These voters constitute the backbone of what used to be the middle class in Greece and it is they who have paid one of the highest prices for the crisis. They have been bled dry by taxation and driven to near-insanity by ludicrous measures such as allowing any tax official to freeze their bank accounts at the slightest hint of a misdeed…. The prime minister…was seen as a leader who could be relied on, who would get the country to the other side of the river. All of a sudden, however, two-thirds of the way across and with the waters calmer, they feel that something has gone terribly wrong. Someone has sowed panic, the crew is starting to argue, the compass is spinning, and the passengers are frightened…. Many battles still need to be fought before we will know with any certainty where things are headed and the government will come under a tremendous amount of pressure in the next few months. How it deals with this pressure will depend of whether the prime minister will tolerate destructive politicians. Hmmm, if a game plan that elevated commitment to national goals above personal interests, encouraged creative teamwork, and inspired diligent preparation for such opportunities as good fortune might present worked for one Samaras, perhaps the other should take heed. 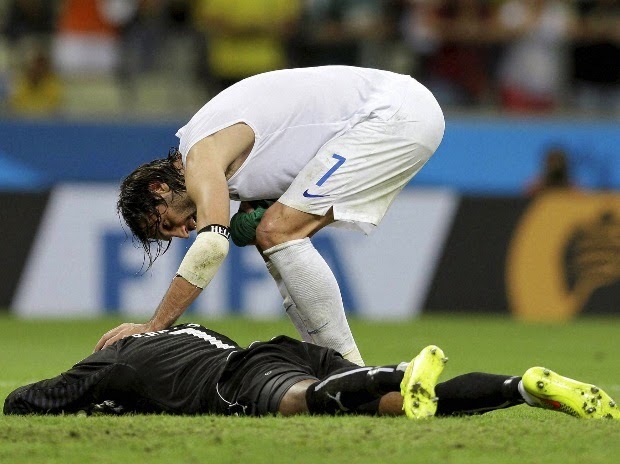 Player Samaras consoling losing team's goalkeeper. This is very childish, immature and a bit silly. We don’t care. Dozens of posts on Murray's website stated that they wanted him to lose his next round match at Wimbledon. Treason might still be a capital offence in England but if Andy ever turned up in an England football top we would do more than hang him - we would take his Irn Bru away. But the headlines the next day were full of it. 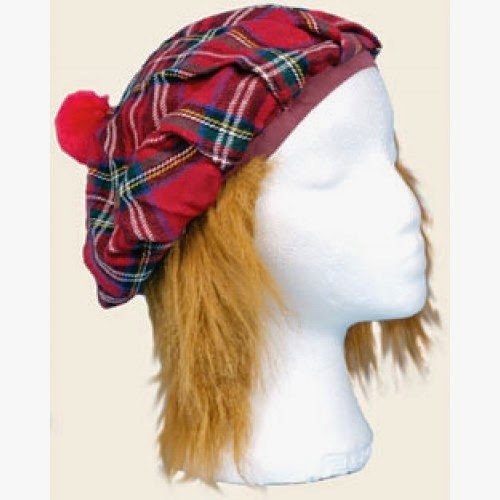 Close scrutiny of the footage revealed the man was wearing a 'See you Jimmy hat' and a Scotland top. He was dancing and hugging the Uruguayans passionately…. The search was on to find this fine example of Scottish naughtiness and he turned out to be a Celtic supporter from Glasgow. This kind hearted chappie had taken a whole load of football tops out to Brazilian orphanages. And attended any game England played... supporting the opposition. The irony of the worst football country in the world (us) giving one of the best footballing countries ( Brazil) football tops did not escape us. We are patriotic not delusional. Then followed the internet hoax about the Uruguay: England game being rigged and that they were replaying it to give England another chance. But that was a hoax. Thank goodness. The truth is that we wish them no harm, the eleven men on the pitch. If they play well they will get as far as they deserve to get. Just like any other team. The fact that those of us North of the Border are growling will have no effect on them, not one iota. The big problem is summed up in one wee scenario. England playing the rugby world cup (Or whatever.) 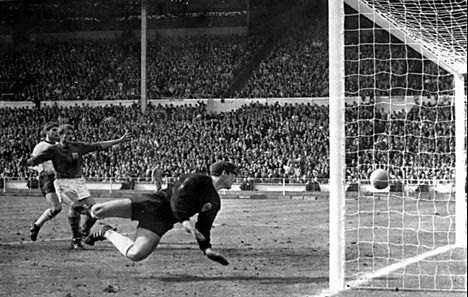 The Scots bookies ran odds as to when the English commentators would mention their football World Cup victory of 1966. The answer….. less than four minutes in. Football is a simple game: 22 men chase a ball for 90 minutes and at the end, the Germans win. They never stop going on about it. 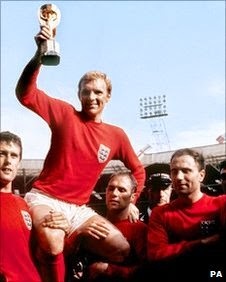 It’s as if they won it then…. And think that other teams are being a bit rude when they turn up to try and win it back..
We never stop saying the ball didn’t cross the line ACTUALLY and as soon as they got back to blighty, we gubbed them 3-1....! It would be very purile of me to mention those two facts so I won't. The oldest international fixture in the world is the Scotland versus England game. One year we were very naughty - invaded the pitch and err... stole it. Ok so there was a bit of damage but nobody got hurt. It was all very good humoured... no violence. 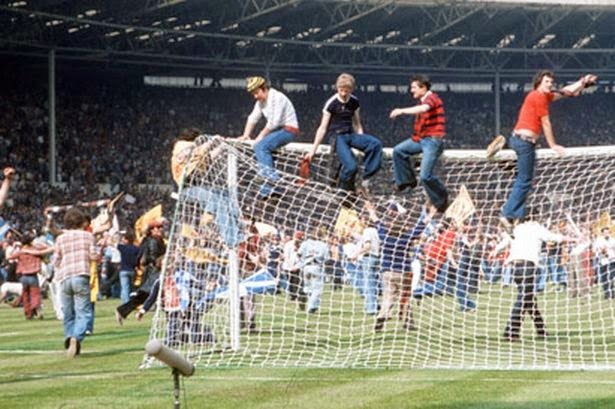 But we did nick the goalposts and smuggled them north. That does not mean that team football up here is not violent. Alchol was banned from the game for a good reason. The sectarian elements run deep and raw. It is tribal. But the national supporters are united and out national team support has never been infiltrated by the nasty extremely racist faction that other national teams have been plagued by. 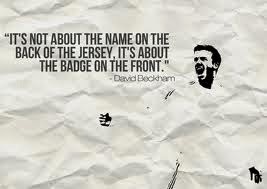 It spoils the game for the real footie fan. 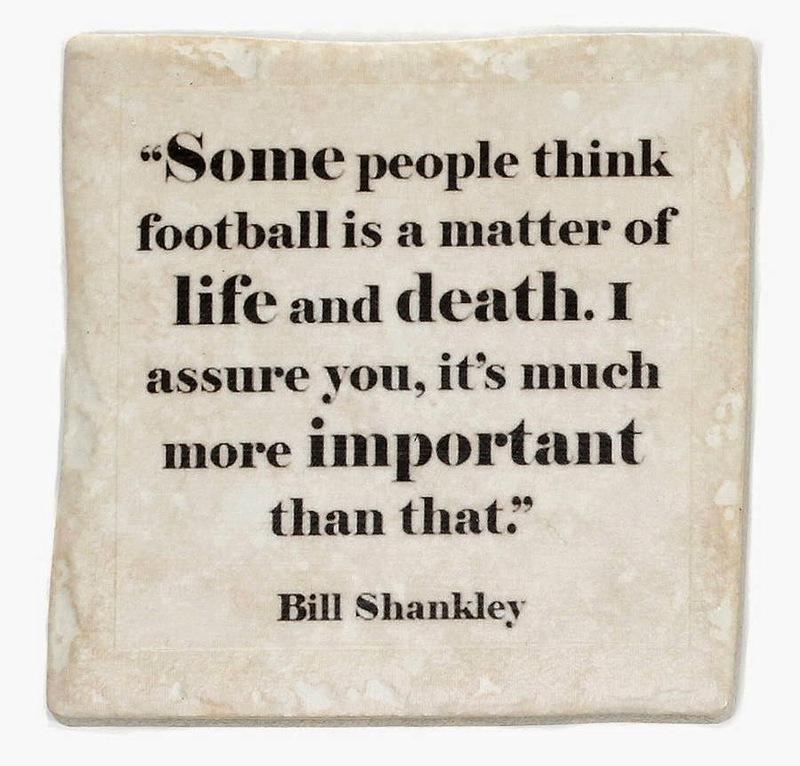 Some might argue that’s because we never qualify for anything. The first Scotland England game was played on 30th November 1872. Nil Nil. We have played 111 times, they have won 46, we’ve won 41, the rest drawn. Wikipeadia says. 'The history of the British Isles has led to much rivalry between the nations in many forms, and the social and cultural effects of centuries of antagonism and conflict between the two has contributed to the intense nature of the sporting contests. 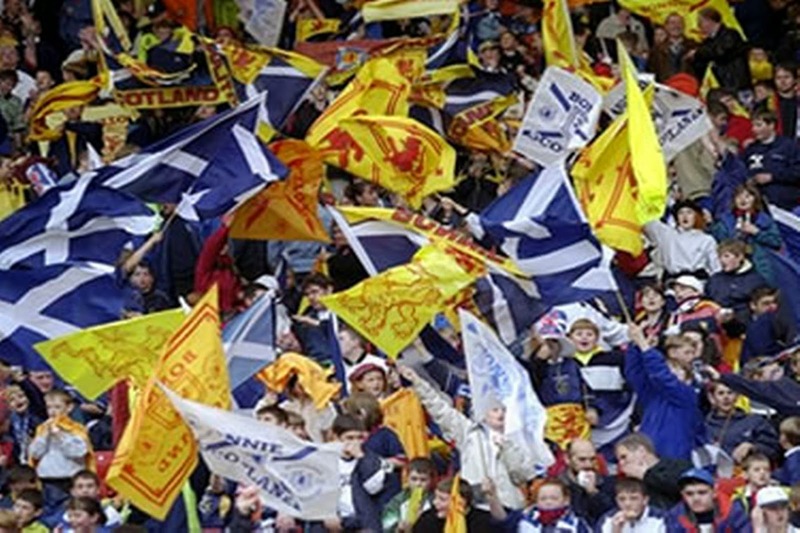 Scottish nationalism has also been a factor in the Scots' desire to defeat England above all other rivals, with Scottish sports journalists traditionally referring to the English as the "Auld Enemy". So there it is in black and white. The No to Independence campaign also sighed with relief when England went out the current competition. If they had continued, the angst of the Scots having to suffer it on the TV night after night (on STV as well as the BBC as the pundits are everywhere) would have resulted in more vote voting yes. I once saw a great film. I think it was The Cup by Khyentse Norbu. I am reposting a blog I wrote a few years ago, in celebration of the acceptance of my favourite place on the planet - the Okavango Delta in Botswana - as the 1000th World Heritage site. "The abundance of life is mind boggling: more than 530 bird species, thousands of plant species,160 different mammals,155 reptiles, scores of frogs, countless insects. Everywhere you look you find life. We surveyed bats and we found 17 species in three days. We started looking for praying mantises and found 90 different species. This is the ark of the Kalahari and this part of Africa." For an outstanding article he wrote - with great photos - read: "Africa's Okavango Delta for Future Generations." The Okavango Delta lies in the northwest of Botswana bordering Namibia. It is formed by the Kavango River, which rises in the heart of Angola to the north and west, then flows over 1200 kilometres south, then east away from the Atlantic Ocean through Namibia into Botswana. There it fans out into a huge delta approximately 15000 sq. kms in size and appears to disappear abruptly into the Kalahari Desert. It is indeed a remarkable sight to see the waters of the Delta on one side of a road and the desert on the other. The 15000 sq. kms of the Delta comprise very low islands, few more than a two or three metres high, channels of water, and areas that are covered with water in the flood season (June to August) and are water-free much of the rest of the time. Consequently, the Delta is a maze of islands and beautiful, crystal-clear water. Access to the islands is by boat (powered on the main channels), mokoros on the smaller channels, and small plane. There are a few roads on the larger islands, but access from outside is usually impossible. One of the greatest pleasures I have ever experienced is to wander along the waterways on a mokoro, which is a dug-out canoe, often made from a sausage tree (Kigelia africana). The passengers, two at most, sit almost at water level, while the boat is poled by a poler standing at the back (like a punt). The shallow draft allows the mokoro to go almost anywhere in the Delta. It is magical to slide silently between the papyrus watching and listening to the birds and spotting wildlife, some of which – the lechwe and sitatunga - are found only in this type of habitat. Of course you have to be careful, because the larger channels are home to many a hippo (‘kubu’ in Setswana), which, when disturbed, can turn in a flash from a sleepy, tranquil lump of lard into Africa’s most dangerous mammal. It gets one attention when nearly 3 tonnes of hippo surfaces next to you, jaws open. Of course, having a hippo surface next to the mokoro is infinitely better than under the mokoro. If that happens the impact can be so great that the boat may break. Even if it doesn’t, the poor occupants will be flung into the water. This too is not a good place to be because although vegetarian, hippos are not reluctant to bite. A glance at the accompanying photo of a hippo mouth shows how dangerous a bite can be. In addition, the Delta is inhabited by thousands of Nile crocodiles. I believe a cooperative agreement exists between hippos and crocs with respect to knocking people into the water, but I haven’t figured out what’s in it for the hippo. Actually, such incidents are few and far between because the polers are experienced and know what to do. In general, when on a boat in hippo territory, the strategy is to bang the side of the boat periodically. The noise piques the hippos’ curiosity, and they pop their heads above water to see what the kerfuffle is all about. All you have to do then is NOT to get between them and deep water, which is their haven. The Okavango is, of course, a magnet to wildlife, particularly when the water is high. Not only are there well over a hundred species of mammals and a big variety of reptiles (over 120,000 elephant are thought to be in Botswana alone), but the birdlife is spectacular, with the Delta boasting around 500 species, from the rare (the huge Pels Fishing Owl, for example) to the abundant –the Red-Billed Quelea can form flocks so large (millions and millions) that they black out the sun and destroy crops like locusts. Michael and I are avid birders and love being in the Delta. About fifteen years ago, I flew up to a small town called Shakawe with some friends. Shakawe is on the Okavango River just as it spreads out to form the Delta. There, in the only time of our lives, we suffered from bird overload. There were so many species in such abundance that we were overwhelmed. A dozen African Fish Eagles in a tree; hundreds of Slaty and other egrets; dozens of different types of kingfishers; lily-trotting Jacanas; cliffs full of Carmine Bee-eaters; and on and on. We just couldn’t keep up with the recording of what we had seen, let alone the photography. Astonishing! Our Detective Kubu is not a bird-watcher and hasn’t visited the Okavango, although he was in prime bird habitat at Jackalberry Camp in the Linyanti. Unfortunately his situation is true of most Batswana. Although I agree with the government policy of low-impact, high income – that is few visitors at a high price - it means that many locals can’t afford to visit the Delta and enjoy what it has to offer. It is probably up to Michael and me to find a pretext for Kubu to make it to the Delta and enjoy what we have always enjoyed. 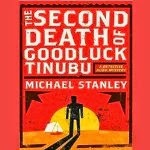 But it is so difficult to conceive of a murder in the Delta’s tranquility! But I’m sure Michael will find a way.